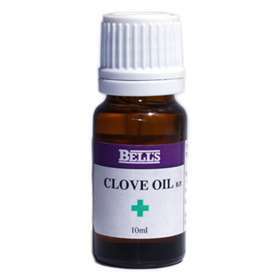 Bell's Clove Oil B.P. - For relief from dental pain - A natural way to relieve toothache. Clove oil is traditionally used for the treatment of oral pain. Clove oil has natural analgesic properties which help relieve the pain of toothache. It also has antimicrobial and anti-fungal properties which make it good to use on acne, warts, scars and parasites. Clove oil has an unpleasant taste so when applying it orally, try not to touch the tongue. It is also very dangerous to ingest, side effects can be fatal so use carefully and only apply it to the affected area. You can do this with a cotton bud or small piece of tissue.